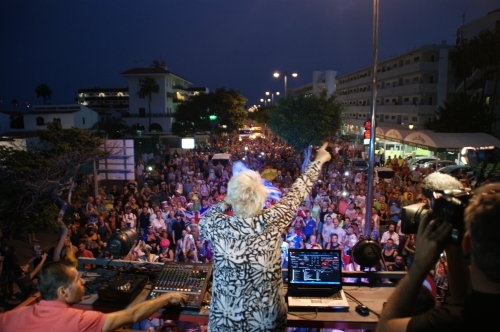 This was a premiere in Gran Canaria - We are celebrating the second edition of Winter Pride Maspalomas and for the first time there was also a parade in Playa del Ingles. Thus, Playa del Ingles has now two pride parades - This was indeed the first Pride Walk, but certainly not the last of the Winter Pride. Even the start of the parade was on time at 6pm. You cannot compare the number of people to the mass of people in May, but that's not a criticism. It was nice the streets well filled and through the twilight with a really great atmosphere - A float led the Pride Walk, which brought the party to the Av. de Tirajana. With German hits and an international audience - A great success and a successful conclusion of the 11/11/2015. Tomorrow (Thursday) evening: Gran Canaria Big Band Swing Night (from 8:30pm).